Does anyone have a very simple, yes simple, wiring diagram they could share with me. I did have one but for the life of me cannot find it. I plan to power the motors from a Gaugemaster M1 cased transformer via a CDU. The Gaugemaster PM20 is a typical surface mounting solenoid point motor. Therefore it must only ever be fed with a momentary pulse of power. Anything longer than around a second or three will result in coil burn out and render that motor defective! 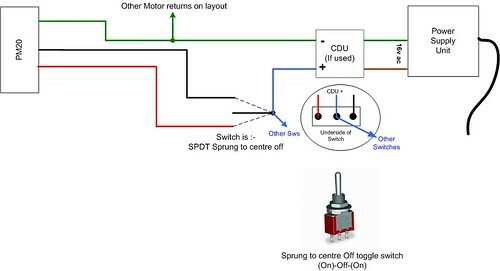 So it is important the point operating switch is of the Sprung to Centre Off type often referred to as (On)-Off-(On) where the bracketed (On) can’t remain in that position when the switches lever is released – it returns to the centre off position by the spring inside the switch. It is also referred to as a ‘Momentary’ switch action. With Solenoid operation, I always recommend the addition of a CDU (Capacitor Discharge Unit) wiring it after the power supply and before the first switch. Normally only one CDU is needed for the whole layout. The CDU stores the power supplied from the power source in its capacitors and releases that power as a ‘beefy’ pulse to the solenoids coil when the switch is operated. This moves most solenoids and also helps stop accidental coil burn out as once discharged the CDU cannot recharge until all switches are in their Off positions. Note; a CDU doesn’t work well with the Hornby R044 Black point lever due to the way that lever is designed, but they do work with all other momentary switches, passing contact point levers or stud & probe or even non locking push button switches. Wiring from the CDU output to the switches/levers and then out to the motors and the return should be in at least 16/0.2mm equipment wire or a similar sized gauge of wire. Each toggle switch will have three terminal tabs. The middle one makes connection to one of the outer tabs depending on which way the lever of the switch in moved towards. Note; conventionally if the lever is up the middle to lower tabs make connection and when the lever is down the middle to upper tab makes connection (opposite to the lever). Wire from one 16v AC supply terminal or the positive output terminal of the CDU to the fist switches middle tab. Then link from this tab to the next switches tab and so on, series wiring or ‘daisy chain’ wiring the switches middle tabs together. Stopping at the last switch. That leaves each switch with its outer pair of tabs going to the point motor that the switch is to operate. The GM20 motor has three wires for its operation - Red, Green and Black. Gaugemaster use Red and Black as the two operation wires and Green as the return for both coils. So from each point switches outer tabs you connect these to the motors Red or Black wires, depending on which way you want the motor to throw against the position of the switch. The motors Green wire connects to the return wire that links together all other motor returns and then goes back to either the 16v AC supply other terminal or to the negative output terminal of the CDU. If you’re not using a CDU it doesn’t matter which way around the feed and return wires connect to the 16v AC terminals. If you are using a CDU then the 16v AC goes directly from the power supply to the CDUs Input pair of terminals, again it doesn’t matter which way around these connect to the CDU input. IMHO the M1 transformer is too expensive by a long way. A cheap wall wart or laptop power supply will work just as well, especially as you are having a CDU. I don't model anything in particular, I just play trains. Why can't people spell "gauge" correctly? Thanks Brian. I could not find the email with the info on so I must have deleted it by mistake. Rog - I already had the M1 laying around so may as well use it. Mmmm small issue with motor number 2. Wired exactly the same as motor 1 but shorts. I then wired motor 5 and disconnected motor 2. Motor 1 and 5 work fine. So, I changed the switch for motor 2 and it, and 1 and 5 work fine so possibly a dodgy switch. So 1, 2 and 5 now work. I then wired motor 3 and now that shorts too. Disconnected it and 1, 2 and 5 still work fine. e.g. Point motor operation power supply? CDU output? Are you even using a CDU? I'm using a CDU. It has a green LED power indicator. When I wired point 1, it worked perfectly. I then wired point 2 and when I activated the point switch on the panel, nothing happened but the green LED went out. I disconnected point switch 2, and point 1 worked fine. I then wired point 5 (it's my own sequence) and it too worked fine. I changed the switch for point 2, and it worked fine along with 1 and 5. Thus 1, 2 and 5 worked fine. I wired point 3 and that LED went out again and the point didn't move. Disconnected it, and 1, 2 and 5 work like they did before. Following your wiring diagram to the letter Brian and all was going well until the problem with motor 2. Changed the switch and we're back on track until I wired in point 3. Not the actual switch causing a problem? I don't think I've encountered a CDU that shows Power is On.. The only ones I've seen have an LED that lights to show the CDU is charged and ready to be used. What make of CDU is it? Wording states... "Bright LED "ready" illumination (2017 new feature)." Means when lit the CDU is ready to be fired into the point motor coil when a switch is operated.